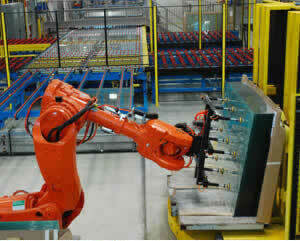 QComp specializes in robotic systems for the flat glass and solar module industry. We offer flexible glass handling systems that are capable of handling a large range of flat glass sizes with speed, precision and robustness. Our glass handling systems include glass line feed systems and end of line racking systems, as well as solutions for end of the line packaging. 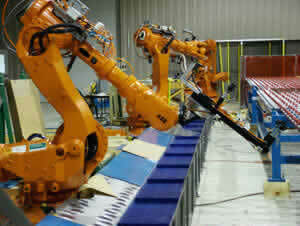 QComp's Rack Unloading systems and packaging solutions are capable of interleaf removal and placement. To complete your glass handling systems, we also offer conveyors, turntables and vision guidance products geared specifically for the glass industry. 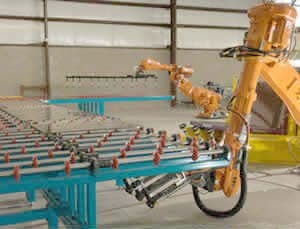 QComp's glass line feed systems utilize robotics to automatically take flat glass from a rack and place to a conveyor or process. 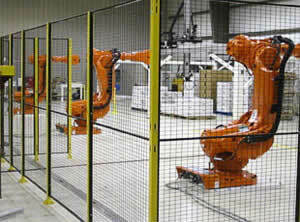 QComp's slotted rack loading systems utilizes robotics to take IG units from the end of an IG line and automatically place them into a slotted rack or L rack. 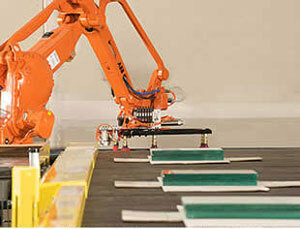 QComp's end of line boxing and crating systems utilize robotics to place glass and interleaf into a box. 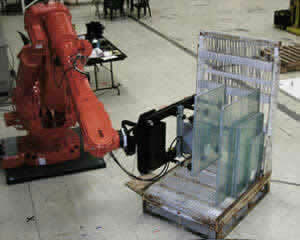 QComp can complete your robotic glass handling systems by providing and integrating other equipment.